Junction improvements in the A1058 Coast Road corridor (east of the A19) including Beach Road widening, Billy Mill junction remodelling and the replacement of Norham Road bridge. The A1058 Coast Road scheme is a highway and transportation improvement scheme for the A1058 corridor and includes the widening of A1058 Beach Road, remodelling of A1058-A1108 Billy Mill junction, the replacement of Norham Road bridge and cycling and walking improvements. 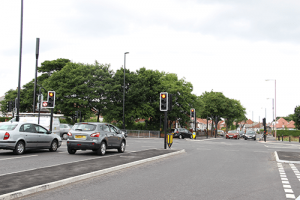 Improvements delivered as part of the scheme will reduce congestion, delays and collisions and improve accessibility for pedestrians and cyclists. The scheme will also deliver benefits for public transport and improve general traffic flows. The scheme will also facilitate the development of West Chirton Industrial Estate.